Should locking kids up be considered child abuse? In June 2014, a Georgia couple was found to have locked up their 13-year-old son in the basement. When child protection workers investigated, they found the boy locked in a small room with a mattress, a box spring and a bucket for a toilet; it had no light, no books, no toys or television. The parents said they had placed him there for disciplinary reasons. He showed no signs of physical abuse or malnutrition, yet the parents were charged with child cruelty and false imprisonment. During my twenty years as a lawyer, I have visited juvenile prisons in a number of states. 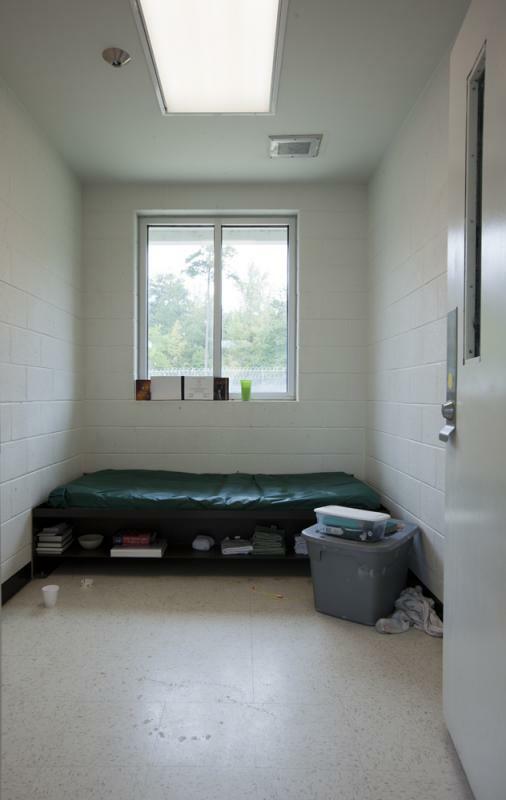 The typical cell in a hardware secure correctional institution contains a stiff slab of metal or concrete topped with a thin plastic “mattress” for a bed, a metal toilet with attached sink, and limited lighting — all behind a locked hard metal door. In many instances personal items are not allowed. Kids can be held in such facilities for years (many average 30 months or 2.5 years). If it’s considered child cruelty when parents lock up their own children at home, why isn’t it similarly cruel when a state does it? In the case of the Georgia couple, their son claimed that the infraction for which he was being punished was that he stole a DVD and then lied about it. He had been locked in a room for more than a year. In juvenile correctional facilities across the country, 75% of kids have done nothing violent. Many youth are locked up for status offenses – acts that would not be crimes if they were adults (such as underage drinking, or being absent from school). So where should we draw the line? Where does appropriate consequence end and cruelty begin? Should the difference be the nature of the offense (whether a crime was committed), or should it depend on whether it was violent? Or should retribution be based on something else, and if so what? Adrian Peterson was indicted for hitting his 4-year-old with a switch, but in juvenile facilities across the country teenagers are held in isolation for days at a time in the name of “punishment.” Both seem extreme, and yet one is considered a crime and the other is authorized. Is it fair that a state carry the child protection badge in one hand while passing judgment on how parents discipline, but then hold themselves to different criteria? Where’s the logic? It is clear that we are long overdue for a conversation about punishment – both for parents, and by the state. As the summer days draw to a close in favor of cooler temperatures and falling leaves, I remember a moment from just a few months ago that both warms my heart, but also adds fuel to my fire to spark change. It’s a hot summer day in South Carolina. I sit with a bottle of water on a mostly empty college campus. What would otherwise be a virtually quiet day is interrupted by sounds of cheers and laughter from teenagers competing in Olympic-like events. Spelling bees, swimming competitions, track, volleyball and tug-of-war are on the itinerary. Chants and songs of encouragement fill the air. Canopy tents are set up for each team to block the heat from the sun. Beads of perspiration on everyone’s foreheads, adults and youth alike; cold water bottles are passed around to help with hydration. Everyone is smiling. This scenario is familiar to most who live in neighborhoods or cities where sporting events are the norm. But can you imagine where I might be and why on this day it seems out of the ordinary? The activities I am observing in fact are not unusual, they happen regularly in communities across the country. Sadly the oddity of this situation is the youth involved in them. The youth I am watching have been arrested and brought in front of juvenile judges to face penalty for their actions. Whether charged with fighting in school, disrupting the family home, or for acting out in various ways in the community, these youth are more often than not disconnected from positive social interactions such as the activities I am witnessing. Juvenile justice systems across the nation are full of youth who have misbehaved (most for relatively minor infractions) but who face harsh penalties. Many youth are not as fortunate as the ones I am watching – most youth who have committed similar infractions are removed from their homes, schools and communities often for many years. Labeled as incorrigible and delinquent, youth in the juvenile justice system, and particularly those who have been placed away from their home as part of their punishment are on a downward spiral — that is if such a descent is not interrupted by positive interaction with caring adults. While most seem to believe that tougher penalties, detention or a locked cell is the proper way to address youth who have been arrested, suspended, expelled or kicked out of their homes, the reality is that such a harsh response is usually counterproductive. Instead of learning a lesson or being “scared straight,” kids who are locked up in response to their misbehavior are subject to an environment that teaches tough street lessons of survival rather than positive coping skills. The event I attended happens to be a learning activity organized by a provider that specializes in working with kids who have become court involved. There are only a handful of programs that I have come across nationally that have found a way to help system involved youth reclaim their childhood while at the same time addressing those anti-social behaviors that landed them in trouble. Responding with love, encouragement and the instillation of hope soothes the harm caused by trauma and neglect and allows kids to look in the mirror and see “a kid” rather than a tough guy who has to prove something to the world. Providing youth the opportunity to develop such pro-social skills as working towards a goal, supporting one another, team work, and good sportsmanship is not a cutting edge theory. Schools and communities invest in these types of activities across the world. And yet in lean economic times, budgets for such investments are drastically reduced. Large numbers of youth nationwide are left unsupervised and forced to navigate large chunks of unstructured time. And then when the obvious happens, when youth lead one another into impulsive activities that cross the boundaries of the law, society wants to respond with undue and unnecessary harshness. No longer does adolescent misbehavior result in grounding, after school suspension, or parents working out an appropriate consequence. These days, juvenile court is the go-to punishment. And not just for a lecture or community service. More often than not, youth who are sent to court end up on probation or being locked up. When that happens unless connected with a responsible, caring adult with the aptitude to bond with the youth and teach while at the same time holding them accountable for their actions, the results are often dire. Dropping out of school, inability to hold a job, disconnection from family and positive reinforcements and ultimately a cycle of infractions, court-involvement and jail is the typical result to over-criminalizing juvenile behavior and punishing kids as if they were adults. As I sit quietly in the hot South Carolina sun and observe teenagers that communities have labeled as “troubled” actively engaged in activities that most of us would find normal and even common, I am bewildered. Why can’t this model of support, encouragement and teaching be the go-to response for such youth? Why can’t we replace the correctional institutions with programs that provide a therapeutic approach? As Maya Angelou said “I did then what I knew how to do. Now that I know better, I do better.” When kids are provided an opportunity to know better – they do better. We know that incarceration is expensive, harmful and doesn’t work. It’s beyond time that we take a hard look in the mirror and make a logical, more-informed decision. Impressions of one’s environment, as well as how people are treated, leave imprints that translate to the reflection kids see in the mirror. Visions leave a residue which settle on the heart as well as the mind. If adults can help young people to see their beauty, their intelligence, their goodness and the strengths they have inside, they will see themselves as strong, capable and smart. If, however, they are ignored, constantly criticized, or allowed to think they are unworthy or simply aren’t worth anyone’s time, that will convey a different feeling, and one that can be hard to overcome. Young people are shaped by their families, their communities as well as the “child-serving” systems they encounter. For most that system is school where if lucky their value is reinforced by adults who teach them that life is a canvass and then provide them with a paintbrush and vibrant colors to paint with. Less fortunate youth are forced into the legal system, whether through their own actions or that of a caretaker and that provides a different lens – one that is significantly gray. On any given day there are nearly 70,000 young people who are incarcerated in juvenile correctional facilities; 75% are there for minor or nonviolent actions (truancy, under-age drinking, minor school infractions). Most of the institutions are prison-like in construction; complete with razor wire, small cells, concrete and bars. Not the type of environment that fosters a positive self-image. Images are powerful, and they are directly connected to youth achievement and well-being. Everyone a young person encounters has the power to either reinforce their value or tear them down. When we as a society respond to youth misbehavior with arrest, shackles, prison jumpsuits and a prison-like environment, can we really then expect that they will be empowered to change for the positive? And when those correctional settings include adults who are trained in coercive instead of rehabilitative tactics, the feeling of despair is compounded. Young people (even those who have made mistakes) need to see their inner strengths so that they can envision a good life for themselves. One full of hope, promise, and even fun! Staff who work with these youth have more success when equipped with therapeutic tools and listening skills, instead of being trained to use restraints and intimidation. The juvenile prison complex across this country needs a makeover – inside and out. Kids need school-type environments where they can be taught pro-social skills, not prisons where abuse is rampant and negativity is reinforced. Adults charged with working with vulnerable youth have a responsibility to not only “do no harm,” but to do what they can to be a positive influence. This requires that we create environments that instill hope and reinforce images of self-worth so that kids can see a picture of themselves that includes a brighter future.